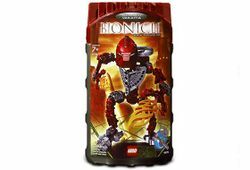 8736 Toa Hordika Vakama is a BIONICLE set released in January 2005. He is one of the Toa Hordika. He has two Blazer Claws in his hands and a Rhotuka spinner and launcher on his back. He is red with green eyes. In the BIONICLE universe, he was a Toa of Fire. Of all the Toa, he was the most comfortable in his new form and eventually let his Rahi side take over. This is a description taken from LEGO.com. Please do not modify it. (see an archive of the product's page) Mutant master of fire! Toa Hordika Vakama fights to lead his team of Toa on the most dangerous mission of their lives, while trying to contain the beast within himself! His Rhotuka fire spinner can burn through any obstacle, and his blazer claws can charge it up to even greater power. Includes instructions to build a Rahi cable crawler with #8736 and #8738! In the movie, BIONICLE 3: Web of Shadows, Vakama's eyes were a red-orange, until he falls to his Rahi side when they become green. Green versions of his mask were used as part of 8940 Karzahni's leg armour. Facts about "8736 Toa Hordika Vakama"